The temple of Sri Panakala Lakshmi Narasimhaswamy is situated on the hill. 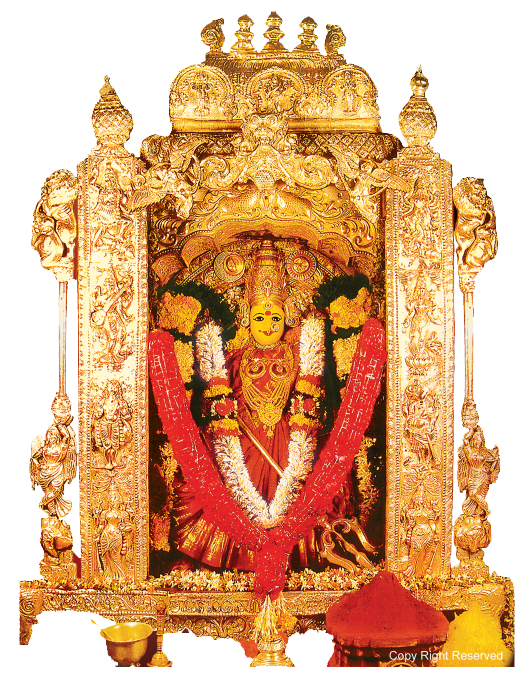 Lord Panakala Lakshmi Narasimhaswamy there is only the face with the mouth widely opened. It is a regular practice in the temple to offer beverage made of jaggery and water as Naivedya. 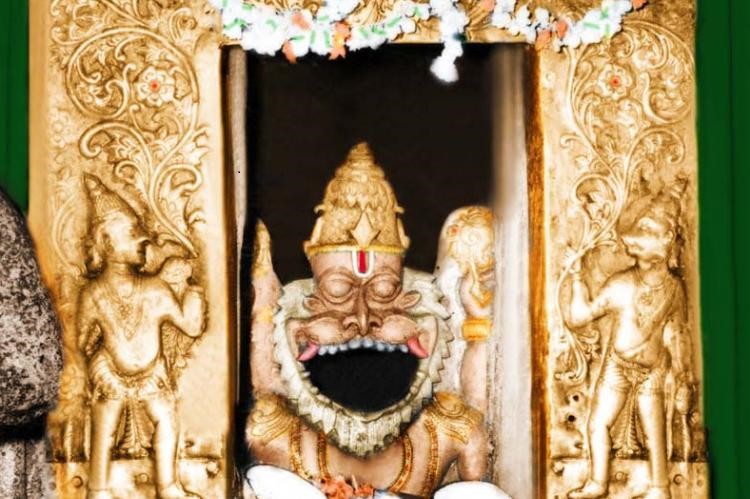 The Image of the Lord in the form of Narasimha (man-lion) and that of Lakshmi Devi to his left are of stone. The garland of the Lord with 108 saligramams is of special significance here. Dakshanavrutha Sankham, a special conch believed to be one that was used by Lord Krishna and resented by the Maharaja Sarfoji of Tanjore, is one more possession of significance of the Lord. Undavalli Caves, located 6 km south-west from Vijayawada, are the caves cut-out in the sandstone hill in the 4th to 5th centuries A.D. Of all the caves, the largest one comprises of four stories and is enshrined with a huge statue of Lord Vishnu. The statue of Lord Vishnu is sculpted in a reclining posture from a single block of granite. Besides, the other caves located at the site are dedicated to Lord Brahma, Vishnu and Shiva. 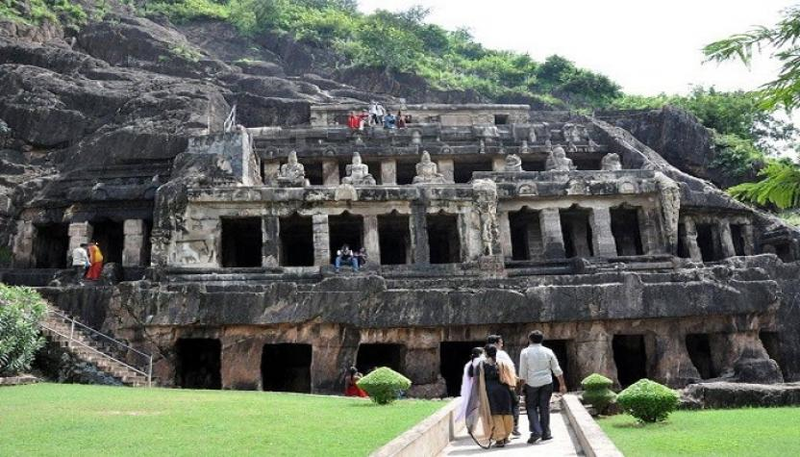 One of the main caves depicts the Gupta architecture, as these caves initially were shaped as a Buddhist monastery. These Buddhist monasteries were designed in the style of Buddhist vihara on the first floor. Dedicated to Anantapadmanabha Swamy and Narisimha Swamy, these caves are also associated with the Vishnukundina Kings of 420 to 620 A.D. These caves overlook the Krishna River and several specimens of rock cut Hindu architecture from above the hill. Kanaka Durga Temple is a famous hindu Temple of Goddess Durga located in Vijayawada, Andhra Pradesh. The temple is located on the Indrakeeladri hill, on the banks of Krishna River.One of the many mythologies associated with this place is that Arjuna prayed to Lord Shiva on top of Indrakeela hill to win His blessings and the city derived its name "Vijayawada" after this victory. It is said that the growing menace of demons became unbearable for the natives. Sage Indrakila practiced severe penance, and when the goddess appeared the sage pleaded Her to reside on his head and keep vigil on the wicked demons. As per his wishes of killing the demons, Goddess Durga made Indrakila Her permanent abode.